Watford's FIRST EVER Fringe Festival is Here! Tomorrow (Saturday 21 October) Watford will see its first ever Fringe Festival, showcasing some of the best talent and artistic activities in and around town. 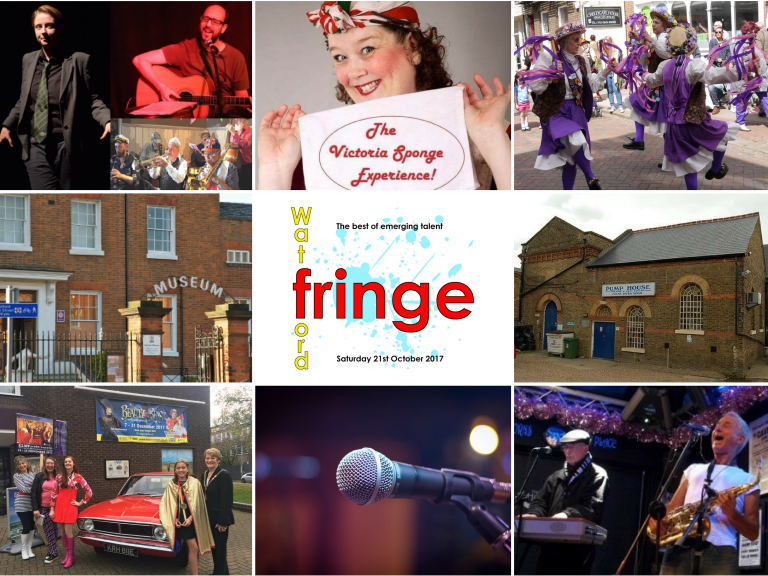 Watford Fringe will be taking place at two of the towns most historic venues, The Pump House Theatre and Watford Museum on the Lower High Street. Ticket prices range from FREE to £6 per person/per show (booking fees may apply and tickets to shows are limited). Experienced musicians Dr Heckle & Mr Jive present a lively repertoire of songs and tunes drawn from several popular music genres topped with an element of comedy. Songs from the shows, showcasing the talent of the Pump House Children and Youth theatre. Watford Museum Nij Biswas A local artist who has been playing guitar for about 25 years. His songs are about anything and everything that he finds inspiration from. His musical influences are derived from a desire to explore the common musical space occupied by several different genres including Indian classical, trance, jazz, blues, folk, rock, and reggae. He’s very interested in collaborating on musical projects including art films, meditation music, music therapy amongst others. Two performers presenting three separate performances showing a friendship through the years. Both comedic and heart felt, ‘The Set of Three’ will leave you wondering, where does the time go? Singers Showcase Performance Following showcase performances at Watford Colosseum and Watford Into, Local Music School Music Gym puts on performances of various Contemporary Pop songs with multiple pupils performing. Watford Open Mic Watford Open Mic. present five of their regular performers doing what they do every Tuesday night in the Colne River Room at The Pump House, Watford. Expect a variety of music and styles and an excellent standard and sound! Victoria Sponge is a housewife like no other! She time travels from the 1940s to entertain you with her unique take on life (and her husband Arfur!) as she sings and laughs her way through the songs of yesteryear. Suitable for all ages even if you don’t know the songs! Watford Folk Club present five of their regular performers doing what they do every Friday night in the Colne River Room at The Pump House, Watford. Expect a mix of traditional and modern acoustic Folk music and song delivered with professionalism and style! Eamon Goodfellow “Life in Progress” Eamon Goodfellow is 46, single, is a Manager in a call-centre and has chosen this moment to branch out into Stand-up comedy. Hear him as he develops new material for his burgeoning career. I, Amdram constitutes Hannah Maxwell’s first fulsome foray into storytelling performance. In this irreverent memoir on family, history and hometown, Maxwell guides a baffled audience through the musty vibrancy of amateur dramatics. In this developing piece, she journeys back to her green and pleasant hometown (Welwyn Garden City), for the Welwyn Thalians’ 2010 production of My Fair Lady: directed by her mother, featuring most of her family, and her final show before she came over all queer of a sudden, cut her hair and moved to London for uni. With the help of show-stopping numbers, half-remembered tap dances, and cut-glass cynicism, Maxwell attempts to mind the gaps between city and suburb, professional and ‘amateur’ art, the places we live and worlds we leave. The music set will feature original electronic music, live vocals and live instruments in a one-artist show. 2kfaces will display the avant-garde of modern music, utilizing everything available to a professional producer and his history as a vocalist and multi-instrument musician. His influences include soul, r&b, indie rock, classical music, African music and percussion, hip-hop, lo-fi and electronic music. In 2014 experienced stand-up comedian Sian Doughty created the character Sally Firth, the mother of a young male stand-up comedian who does her version of his act, using his notebook. “Sally Firth” has been named as One to Watch by the judges of Funny Women 2016, was shortlisted for Silver Stand Up of the Year 2017. This show is suitable for over 16-year olds. After years of honing his craft in bands around Watford’s thriving scene, 2017 has been a good year for Cappellino which has seen him picked to play during the half time entertainment at last season’s FA Cup final, as well as being long listed for Glastonbury 2018. His debut EP was released earlier this year and received weekly airplay on Vibe 107.6 FM alongside fellow “Raw Vibes” artist Jack Garratt and The Hunna, and has achieved over 10,000 plays on Spotify. Prize winning Watford writers will entertain you with their poetry and prose. Light-hearted, heart-warming and fun. If you think you don’t like poetry, come along and be pleasantly surprised!